Pro customizing uses all current NHL, IIHF, and pro hockey patterns. Your jersey will be customized just like the ones worn on the ice! All patterns are hand cut and sewn to the jerseys. Pick your favorite player or put your own name on the jersey. Note: All customized orders will take approximately 2-4 weeks for delivery, as names and numbers are sewn onto jerseys just as they are worn on the ice! #638673-419 Crafted by Nike, this jersey features paneled construction and underarm ventilation. 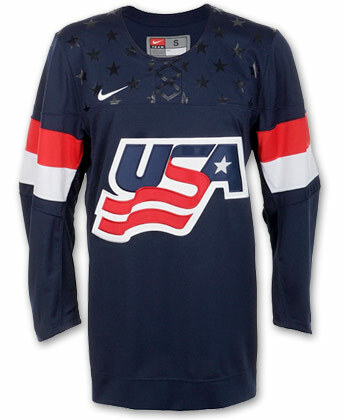 The jersey is decorated with the embroidered “USA” wave at mid-chest, “swoosh” logo at upper right, printed navy star detail on upper chest panel, and patriotic stripes on sleeves.